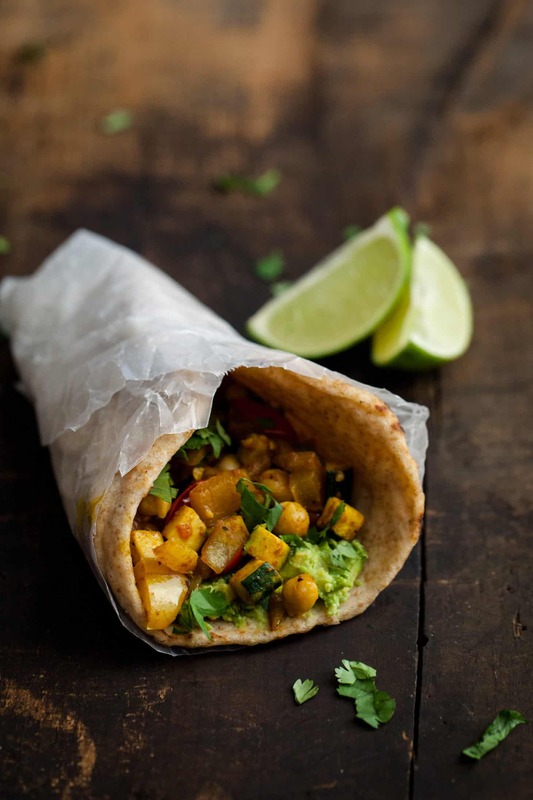 Curry Roasted Vegetable and Avocado Naanwich | Naturally. I picked up whole-wheat naan at the store but you could make your own as well (make it gluten/grain free with this naan or simply vegan with this naan). 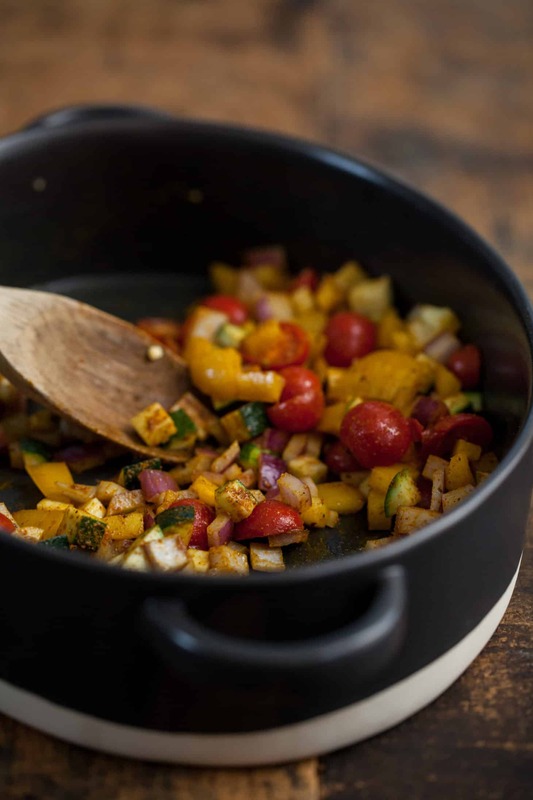 Also, feel free to play around with the vegetables you use- eggplant, summer squash, and different pepper varieties would all make great substitutions/additions. Other than roasting- this meal comes together quickly and can easily be packed up for a lunch on-the-go. I’ll also sometimes skip the naan and throw the vegetable/avocado mixture over quinoa/brown rice- so good! Preheat oven to 425˚. 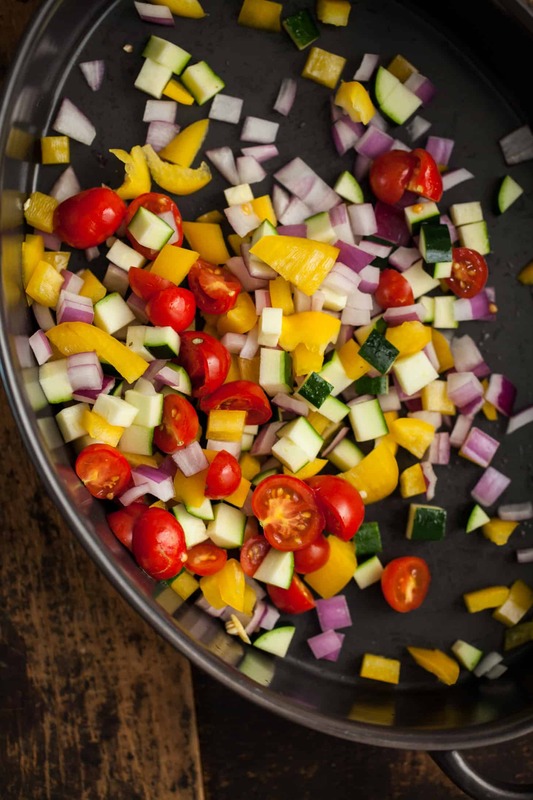 In a roasting pan, toss together onion, pepper, tomatoes, zucchini, olive oil, curry powder, and salt (if using). Roast for 15-20 minutes until vegetables are tender. Stir in chickpeas and continue to cook for another 5-10 minutes. 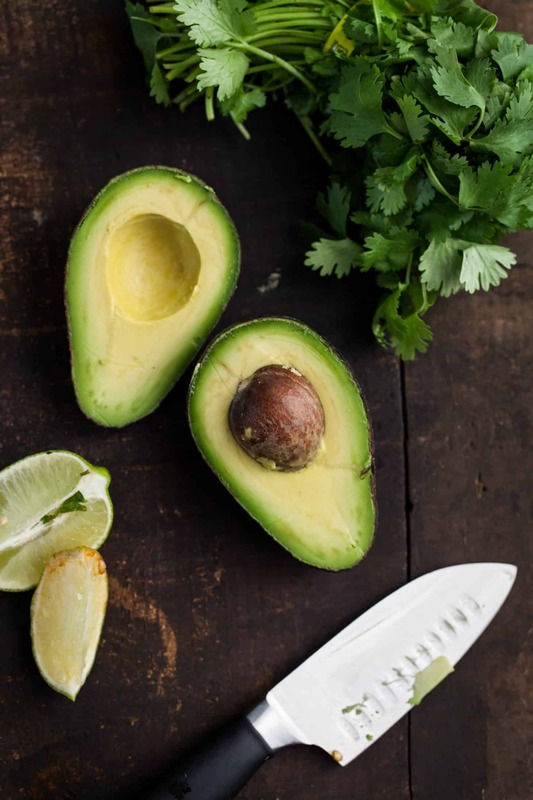 While vegetables are roasting, in a small bowl mash together avocado, cilantro, and lime juice. 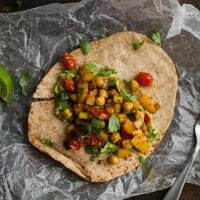 Once vegetables are done, assemble naan-wiches by smearing avocado on the inside and a few spoonfuls of roasted vegetables. Sprinkle with cilantro and squeeze a bit of lime juice over filling. Roll and wrap with parchment to secure. *Depending on the curry powder you are using, adjust the salt. I prefer to use a salt-free blend that I can adjust the amount of salt I use. Be careful to not overdo it! *Don’t want to turn the oven on? Simply toss everything in a foil packet and place on the grill. Cook until vegetables are tender. A naan-wich! I love it…this is going on my “must make” list ASAP. Thanks for sharing! This sounds amazing Erin! I love roasting vegetables and avocado sounds amazing! Naan-wich! This is genius! I am a big fan of naan pizzas, but this is the perfect way to do something a little more traditional but still a fun twist! I love this idea, and I would always chuck an avo in, because they are the best – great minds! Mmmm love the idea of a naan-which!! Big puffy naan would make this fantastic! This looks amazing! Can’t wait to try it out! So delicious and simple! Love that the guacamole is the glue. I have the Flavor Thesaurus which is similar. It’s the best! 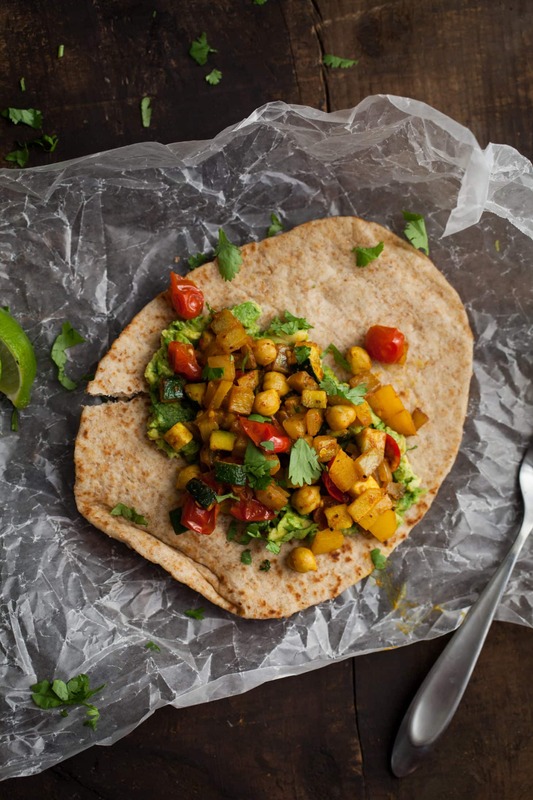 I’m a big fan of naan bread, so stuff it with curried veggies and I’m there! This sandwich looks totally up my alley! I always have odds and ends of veggies and spices hanging around; this is a great way to use up both! I just got introduced to The Flavor Bible recently and I’m in love. Such a great source of inspiration! This naan-wich looks incredible!! I’m not a fan of naan but your recipe makes me become one 🙂 So delicious!! I’ve become obsessed with naan-wiches lately…there’s just something about them that never fails to entice me, but you’re right – they are often disappointing! This one sounds absolutely bursting with flavor. As an aside, I just added The Flavor Bible to my wedding registry. Can’t wait to get it! Just made this for dinner. My husband and I thought that it is super filling, healthy, and delicious. Avocado really takes it to the next level. 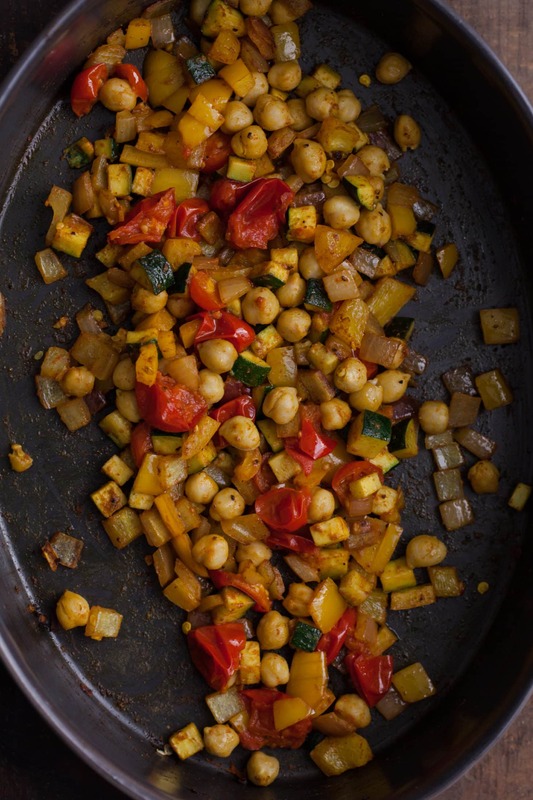 What a great combo—and so versatile— I can imagine this with any number of veggies, yum! I only had Jamaican curry powder so I tried that and left out the cilantro. Amazing, as always. And so easy and colorful. Cheers! I tried this today with mini whole wheat pita pockets instead of the naan (as I couldn’t find whole wheat naan at the store). But it still turned out to be great! I prepared a few and they looked like mini burgers, so cute 🙂 And they tasted really good as well! Thanks a lot! This look so good! I will try it today. Thank u.